Happy to share that Of Field and Forest will be attending the North Grenville Sustainability Fair - in the nick of time for Easter and Spring time celebrations. Located at 285 county Road #44 in Kemptville, ON. Make your attendance at this one part of your Winter Coping Strategy. There will be so many talented folks showing up. There will be food. There will be warmth and camaraderie as we plod through the waning days of Winter together. And there will be the works of talented makers. Works created with the intent to bring joy and comfort long after this show is done. All the artsy and crafty goodness that is Merrickville. Food. Art. Home decor. Fashion. All your holiday shopping under one large and beautiful roof. The Merrickville United Arts Centre. Parade day in Merrickville will find me and my woolly friends set up on the main drag outside the Village Bean Coffee House. Alongside the salted caramel magic that is Pickle and Myrrh. Kicking off the holiday season in my hometown. Veering outside my usual felt work for this one. You will find me here. Alongside some of my favourite folks of all time. My table will be stocked with preserves from my gardens and of course all my seasonal home decor goodies. If I am not to be found at my table, check the field of sheep. 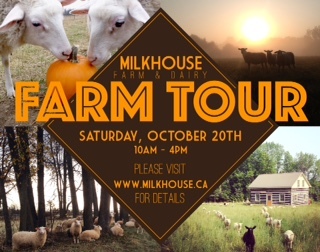 More info on how to spend a great day can be found at www.milkhouse.ca. This Saturday on the grounds of Heritage Stables in Merrickville, I will be participating in a Thanksgiving farm stand alongside other local vendors. Stop by and stock up on farm fresh baking, preserves, produce, eggs and maple syrup. Also, Fall inspired home decor pieces to create all the cozy feels - inside or out. Local growers. Artists. Micro-producers. Farmers. All the Wednesdays, through til Thanksgiving. 3-6 in the evening. Main Street, Merrickville, Ontario. Part of the Rideau Canal Waterway. Making the most of seasonal. Back again after the success of last year's event. The Art of Dressing fashion show is exploring the idea of evolution this time around. A unique show with food, wine and music to help highlight the incredible collaboration between 15 local artists. All the unique and one of a kind pieces featured in the show will be available for purchase in a post-show market. For more info check out The Art of Dressing. There was a time when woollen mills were part of the landscape of many Canadian towns - creating blankets and clothing with the warmth and longevity needed to make Winter survival possible before the advent of insulation or forced air furnaces. Plenty of these blankets still exist today - and in fact are enjoying a resurgence of popularity thanks to their "vintage" status. While many show signs of age, there is the opportunity to create new beauty from these woolly items of historical and natural significance. They provide a background for new creations that carry the original intention of warmth into our homes once again. Just in a slightly different way. Join me in a workshop where we will explore wool felt as a medium and in the process create a table mat similar to those pictured above. Supplies will be provided. Cost: $50 includes all materials including tea and snacks. The on-line payment option found on the Homestead Sales page of our website secures your registration for this workshop. LittleWool will be coming out of hibernation along with many other local makers. With beautiful things to help us all over the hump of Winter. Food, Music and Winter comradery on-site. Mark your calendars folks! Just like they do in Europe. With every possibility of gentle snow falling. I am REALLY excited about participating in this one! 118 Brock Street West, outside of Healthily Ever After. Parkas, warm boots, flask in pocket. LittleWool will be coming out of hibernation along with many other local makers...showcasing new goodies for 2017. Live music and 5$ tapas for guests.